CREPES SUZETTE RECIPE & HISTORY - all you need to know! 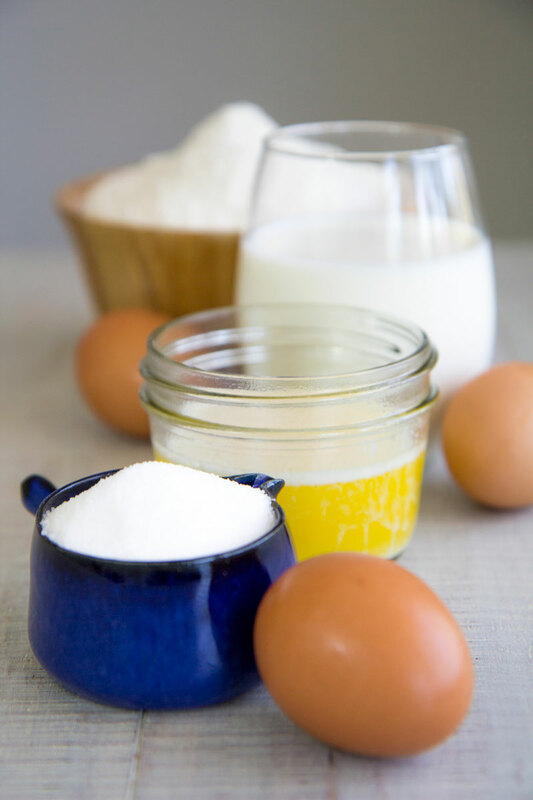 You are here: Home / Recipes / Vegetarian / CREPES SUZETTE RECIPE & HISTORY – all you need to know! As I said, in the same way as the Brownies, or Ganache, the Crepes Suzette were created accidentally. The legend says that it was 1895 in in the Principality of Monaco. The then Prince of Wales and future Edward VII King of England was having a diner at the Café de Paris of Monte Carlo with some friends and other nobles. At the time for the dessert, the young assistant waiter Henri Charpentier, has been completing the Crepe au Grand Marnier beside a chafing dish. Fate made the flame under the chafing dish torched the alcohol witch covered the Crepes. It’s easy to imagine Henri scared to be scolded, maybe dismissed. So, before confessing what happened, he made a decision that has changed the history of the cuisine: he tasted the sauce, and it was so delicious! The sugar was caramelized and perfectly blended with orange sauce and Grand Marnier; so the young waiter finally got up the courage to bring the sweet mistake to on the table of Prince Edward. Henri Charpentier himself describe the scene on his memory “Life a la Henri: Being the Memories of Henri Charpentier”. The Prince was so pleasantly surprised to finish not just the Crepes, but all the sweet-and-sour sauce until the last dollop! When the Prince asked to Herni the dessert’s name, he answered: Crepe Princesse. But, at this point, the Prince decided to change the name in honor of a young French noble dame sitting at his table: Suzette! 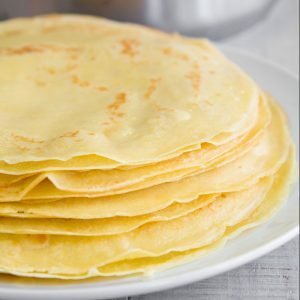 Before to prepare the Suzette Sauce, you need to make the basic Crepes, click here for the recipe! It is possible to cook the Crepes and the sauce the day before. 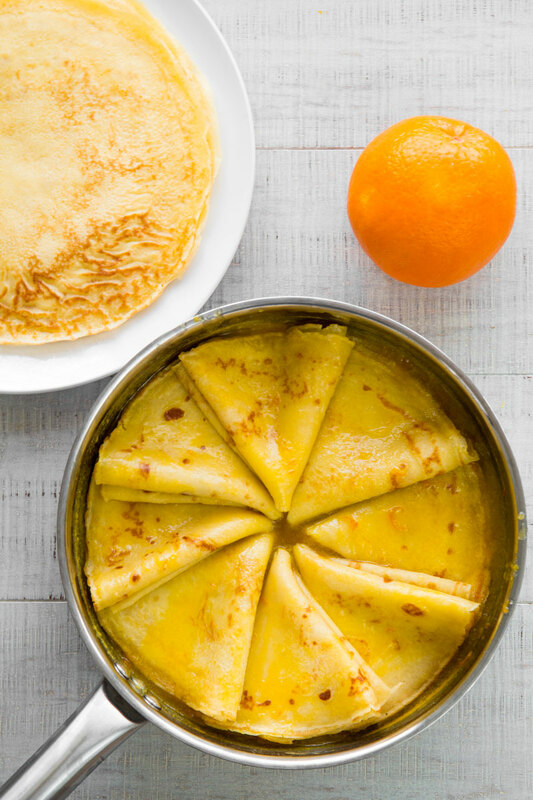 In this way, preparing Crepe Suzette will be very easy and fast, particularly if you are serving a brunch or a post-dinner dessert: just torch the crepe into the sauce and bring them to the table! Peel the outer colorful skin of 1 orange and reduce the skins into zests; discard any white part or the sauce will be bitter. 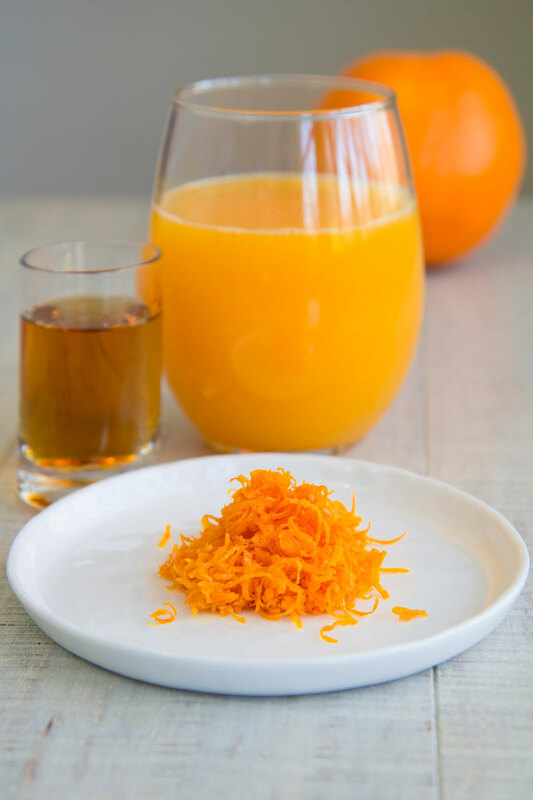 Now squeeze the juice of 2 oranges, then sift it and pour in a glass. Pour the butter into a saucepan along with sugar. Now place the pan over medium heat and stir constantly until the butter melt and create a consistent cream with the sugar. Keep cooking until the cream starts to become brown. 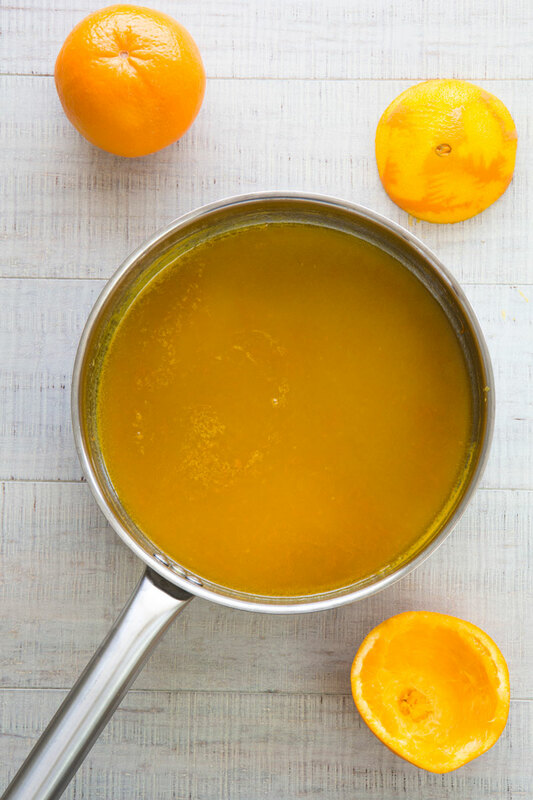 After that, add the orange juice into the pan and continue cooking until the sugar is completely liquefied, stirring occasionally. Finally, raise the flame and pour 1/3 cup of Grand Marnier or Cognac. Let the alcohol vapors evaporate, then add the orange zests and cook a couple of minutes more. Now, make or reheat the crepes, then brush the Crepes with a little amount of Suzette sauce and close them bending into triangles. After that, place the crepes into the Suzette sauce, and place again the pan over high heat. At this point, this is the moment for Gran Marnier. The flambe technique is not easy for an inexperienced chef, so proceed with caution or consider to avoid this step. If you feel confident, pour the liquor and set on fire with a Crème Brulee torch. To extinguish the fire, rise up the pan far from the heat, or wait the alcoholic vapors evaporate. 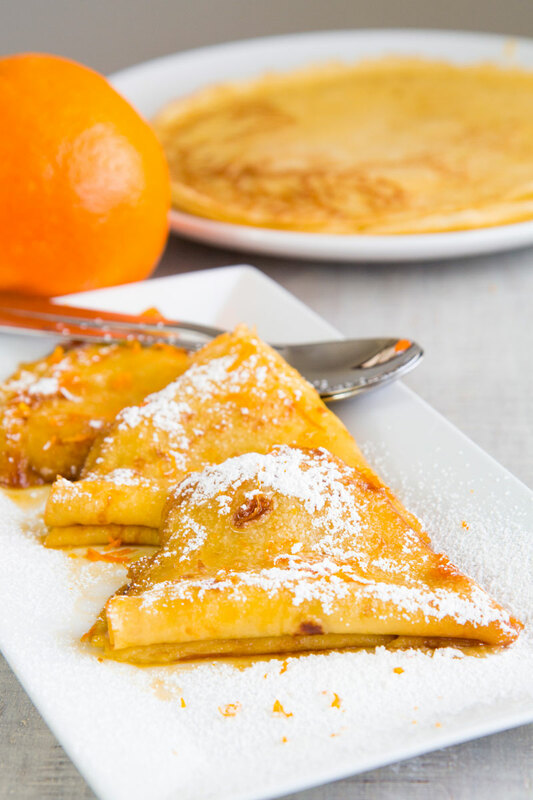 Serve the Crepe Suzette immediately, optionally powdered with sugar powder. CREPE SUZETTE RECIPE & HISTORY - all you need to know! 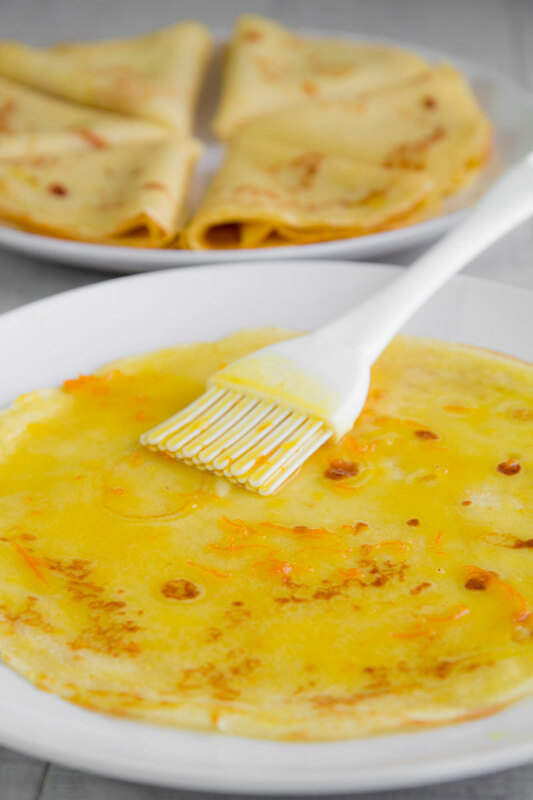 Before to prepare the Suzette Sauce, you need to make the basic Crepes,click here for the recipe! It is possible to cook the Crepes and the sauce the day before. 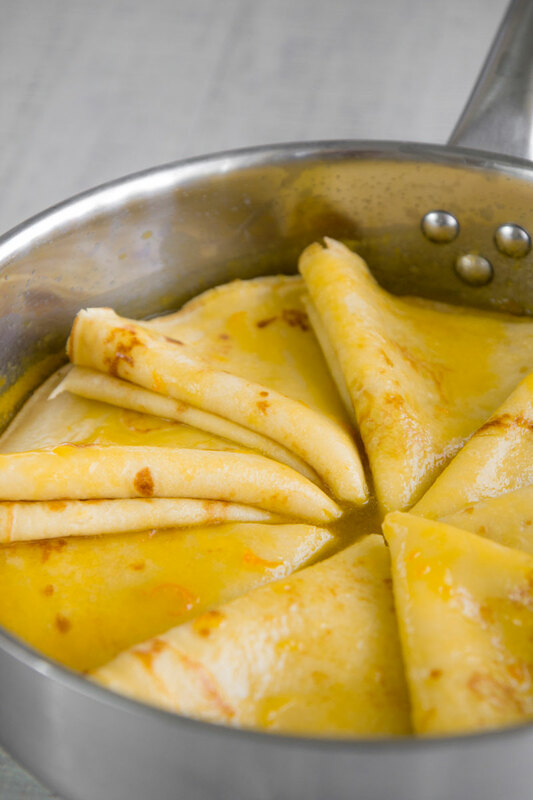 In this way, preparing Crepe Suzette will be very easy and fast, particularly if you are serving a brunch or a post-dinner dessert: just torch the crepe into the sauce and bring them to the table! Pour the butter into a saucepan along with sugar. Now place the pan over medium heat and stir constantly until the butter melt and create a consistent cream with the sugar. Keep cooking until the cream starts to become brown. After that, add the orange juice into the pan and continue cooking until the sugar is completely liquefied, stirring occasionally. Finally, raise the flame and pour ⅓ cup of Grand Marnier or Cognac. Let the alcohol vapors evaporate, then add the orange zests and cook a couple of minutes more.